The Paiter-Surui indigenous group in the Amazon rainforest was nearly wiped out from years of disease and deforestation. But now, with help from the IKEA Foundation and nonprofit Forest Trends (publisher of Ecosystem Marketplace), the Surui and Yawanawa tribes are thriving again under sustainable economies that allow them to maintain their centuries-old culture. 7 July 2015 | The scene is idyllic: Children scamper across a clearing in a forest, a boy swings a baby into the air, nuzzling the child’s cheek. A girl windmills her arms as she skips to a nearby hammock hung between two enormous trees. A group of women work steadily at making jewelry, staying cool in the shade of one family’s dwelling. The task demands great concentration, as they pound tiny shells into shiny beads, using very large and very sharp knives. It’s a slice of a day in the life of the Paiter-Suruí, a group of indigenous people in Brazil, where the community is thriving in more than 20 villages straddling the Brazilian states of Rondônia and Mato Grosso, tending their rainforest home and strengthening the centuries-old culture that has sustained them. But such a scene was greatly endangered after the Suruí’s first prolonged contact with the world beyond the forests surrounding their villages in 1969. Since being almost wiped out by disease, the Suruí gradually have been recovering and building their community to be stronger. Not the least of such efforts involves fighting continued threats from illegal mining, logging, and cattle ranching to their home, the rainforest. It’s a fight that endangers not only the future of the Suruí and other indigenous peoples who call the rainforest home, like the Yawanawa community in the Brazilian state of Acre, but also the future of our planet. The rainforests of Earth act as enormous sponges, sucking up carbon in our atmosphere and storing it, carbon emissions that would otherwise play a huge part in accelerating climate change. The statistics are daunting: Settlers illegally log and convert indigenous forests to pasture, often with violence. Cattle ranching is one of the primary drivers of deforestation, constituting 80 percent of the world’s deforestation to date. And in just one year, 2010, the Suruí, expelled 100 logging operations from their lands. More than a quarter of forests in developing countries are owned and/or managed by indigenous and other forest communities. The maintenance of indigenous peoples’ traditional cultural and customary practices is connected with the conservation of the Amazon rainforest, which in turn is the most important reservoir of carbon stocks globally. In the Brazilian Amazon alone, roughly 27 percent of carbon stocks are found on indigenous lands, representing approximately 13 billion tons of carbon. 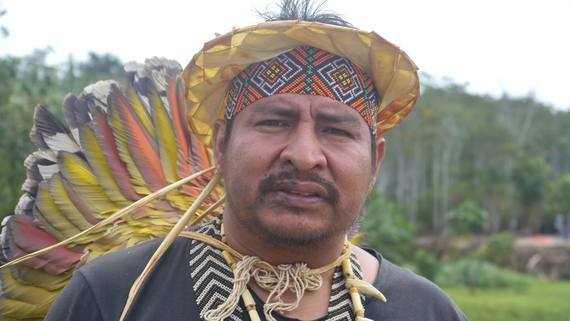 But the Suruí and the Yawanawa aren’t alone in their struggles as stewards of these valuable swaths of land — they just got some important help in their fight to maintain their forests. Jonathan Spampinato, head of Communications and Strategic Planning at the IKEA Foundation, explains in a recently released video, “Creating a Better Future for Children in the Amazon,” how the foundation and the international nonprofit Forest Trendsare working with the Suruí and the Yawanawa, leading voices of indigenous peoples in the Amazon Basin, around the management and protection of their forest lands. The work is part of an innovative partnership called Leveraging Opportunities for Amazonian Indigenous Youth and Women in Brazil. The thrust of the program is to provide ways for the community to thrive through the integrated management of the forests, establishing alternatives to non-sustainable timber extraction and cattle ranching, providing new livelihood opportunities within the Suruí and Yawanawa communities, as well as nourishing their traditional cultures. The program kicked off last year with the opening of a handicrafts store run by Suruí women. The store’s cabinets brim with a rainbow of colors: exquisitely beaded bracelets and necklaces, baskets, and other items. All the profit goes back to the women of the Suruí villages, offering a new and much welcome level of economic independence and empowerment. A group of Surui men tromp through the forests, carrying heavy loads. Yet they are not loggers with a mission to clear-cut the trees and ship them to be made into expensive furniture. Rather, these indigenous people carry machetes and seedlings. The knives they use to hack large fronds of bananas they have meticulously planted and now will harvest to consume and sell, and the seedlings will be planted with a careful and informed eye to sustainability. The small plants have come from a garden in the communities’ clearing, where clusters of men dig in the dark earth, tending the plants that will replenish the surrounding forests. Another aspect of the program is the Peer Youth Learning Exchange. This provides a forum for youth from the Suruí and the Yawanawa communities to come together and exchange ideas and information. In this way, they strengthen their individual communities but also give power to the voice of indigenous people as a whole. At one such gathering, a group of young people sit in the cool interior of the Yawanawa community center, a large wooden structure. Their faces are solemn and curious, eyes bright. Through meetings like this one, “they can share ideas about the past, but also share ideas about the future. It’s a leadership program for them,” says Spampinato. The work of protecting this culture is an example of promising new efforts to protect the Amazon, one of our planet’s most precious resources. These efforts — coming from the people who live there, like the Suruí and the Yawanawa, and from programs like those spearheaded by IKEA Foundation and Forest Trends — reflect a hope and promise that is all too often missing from current discussions of climate change. This work also points to a certain reverence and deep understanding of the forest land of our planet, an understanding held most closely by indigenous people. Ann Clark Espuelas is a writer for Forest Trends.